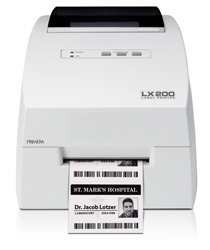 Primera’s new LX200 Desktop Label Printer utilizes high-resolution monochrome inkjet printing to produce a wide range of bar code and identification labels up to 4.25" (108mm) wide. This compact and affordable printer delivers many features and benefits not available with other printing technologies. Unlike thermal transfer label printers, the LX200 doesn’t use a ribbon. Instead, it “jets” ink directly onto plain paper or specially-treated, high-performance inkjet substrates. This process leaves no spent ribbon behind that shows a mirror image of what has been printed – important for HIPAA and a host of other government and industry confidentiality requirements. 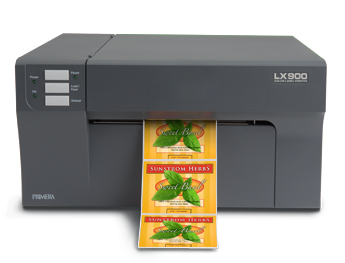 The LX400 utilizes the latest in high-resolution inkjet technology to print brilliant full-color products labels on-demand! . 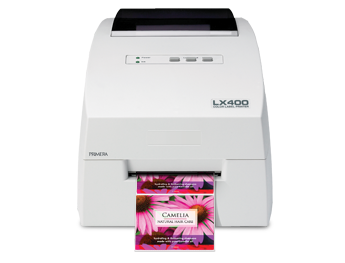 LX400 Color Label Printers include one dye-based color ink cartridge, NiceLabel™ SE Primera Edition design software, printer drivers for Windows ® 2000/XP and Mac ® OS X 10.2 or higher, starter roll of 4” x 3” Tuff-Coat™ High-Gloss Inkjet Label Stock, USB 2.0 cable and instructions. Requires an available USB 2.0 port. There’s no need to settle for low-resolution color labels on your products. LX400’s incredible 4800 dpi printing delivers results that far exceed virtually any other on-demand print method available. Four built-in print resolutions let you select the combination of print quality and speed that fits your application best. No matter which you choose, your labels are bright, colorful and professional. Creating labels takes just minutes on your Windows XP/2000/Vista or Mac OS X, 10.2 or higher. You can mix any combination of text, graphics, photos, illustrations and even bar codes. NiceLabel™ SE Design Software is included for your basic label design needs. You can also use most other graphics applications, such as Photoshop® and Illustrator®, giving you flexibility and creativity in your designs! LX400 prints onto many label, tag and ticket materials, including inkjet coated high-gloss, semi-gloss and matte labels. Labels printed on high-gloss material are highly scratch- and smudge-resistant and highly water-resistant*. This is a perfect solution for primary or box labels that can be exposed to water, rain and snow. Label print width can be as narrow as 0.75 inches and as wide as 4 inches. Maximum label length is 24 inches. Print Full-Color Labels Fast & On-Demand! LX900 incorporates the most advanced inkjet technology ever offered in a desktop label printer. Called Primera Imaging Perfection™, this all-new printing technology delivers razor-sharp text, graphics and the most photo-realistic printing possible. Color droplet size is just 4 pL and black is 5.5 pL – the smallest available on an industrial-grade color label printer. Print resolution is up to 4800 dpi versus just 1200 dpi on other printers. LX900 has individual inks for Cyan, Magenta, Yellow and Black. This means you only need to replace the ink cartridge that has been depleted instead of the entire cartridge, saving money on every label you print. You’ll also be printing “greener” by not wasting ink if your designs use more of one color than another. With its fast print speeds, incredible print quality and affordable acquisition and per-label costs, Primera’s LX900 is simply the best desktop color label printer you can buy. Your products deserve labels that are so easy to produce, cost so little and look this great! 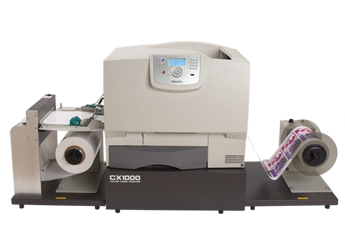 CX1000 makes it so fast and easy to produce your own labels in-house that you'll wonder how you ever got along without it. No longer do you need to order massive quantities of pre-printed labels. There's no lead time and no set-up charges, either. Just import your label files into the included PTPrint™ Software, specify how many you need, and press "GO!" It's that simple. Printing your own labels saves time and money in other ways, too. Design changes can be accomplished immediately so you'll have no wasted inventory – print only the labels you need when you need them. Cost per label is almost always significantly lower than outside vendors, too. One of the best things about CX1000 is its incredible 2400 dpi print quality. Compared to 1200 or 1600 dpi machines, you'll notice a striking difference in overall quality. CX1000 output has much deeper and far more vibrant colors. Dot patterns are virtually imperceptible. And for the most precise color control, Pantone® -approved spot color support is included. Print speed is 16.25 feet per minute (5 meters per minute). You can print up to 500 feet (152.4 meters) at a time which nominally equals an 8" (204mm) diameter roll. Once a job is started, it can be left unattended. A built-in cutter automatically cuts the web once the job is completed. You'll come back to a roll of finished labels ready to be applied to your products manually, semi-automatically or by an automated applicator. It really doesn't get much easier or enjoyable to produce your own labels in-house! CX1000 prints onto many different laser-qualified label materials, from pressure-sensitive plain papers to white and clear polyesters and more. A wide range of approved matte, semi-gloss, high-gloss and specialty food and beverage label materials are available. We've even qualified an all-new range of eco-friendly materials that are made up of 100% post-consumer waste. Printed labels are waterproof, as well as highly scratch, smudge and tear-resistant. They've been specifically engineered for best-in-class performance with the toner used in Primera's CX-Series Color Label Printers. Dozens of popular pre-die cut sizes are in-stock and ready for immediate shipment. Custom sizes are also available. From initial set-up through running big jobs, you'll find that CX1000 is as simple to use as any desktop office printer. There's no proprietary operating system or inflexible built-in computer, either. If you'd like additional help getting started, we offer free technical support for the life of your unit.